Good: Fun to use your own voice! Boo! 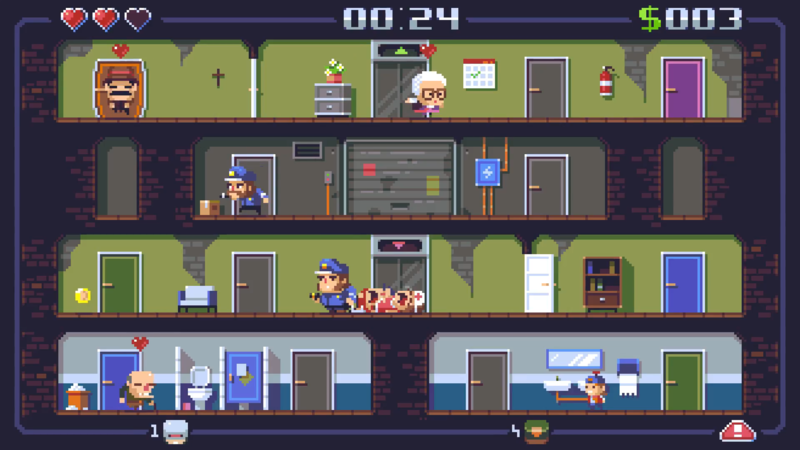 Greedy Kid is a game about a kid who scares the elderly half to death to steal their money to buy soda. But the real interesting part is the controls: you’ll need to scream into your microphone to let the kid scream at the old people! This game has been developed by Flying Oak Games, and is published by Flying Oak Games together with Plug In Digital. When starting the game you’ll get a short intro sequence to show what the whole game is about: a kid who apparently loves soda, and wants to get as much money as possible to buy soda. He also happens to love to scare people – combine that with his need for money and a plan is born: elderly people can be scared into a heart attack, which makes it easy to steal their money! But you shouldn’t get caught! The graphics of Boo! 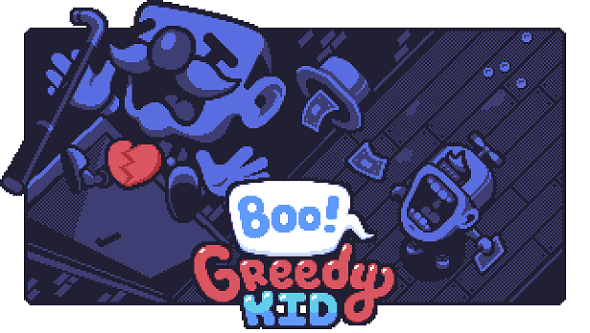 Greedy Kid are retro pixel style graphics. Each stage has multiple rooms, connected by doors. Colored doors lead to another area on screen, and white doors can be used to separate a part of a stage, so you can scare people one by one, without getting spotted by other characters. 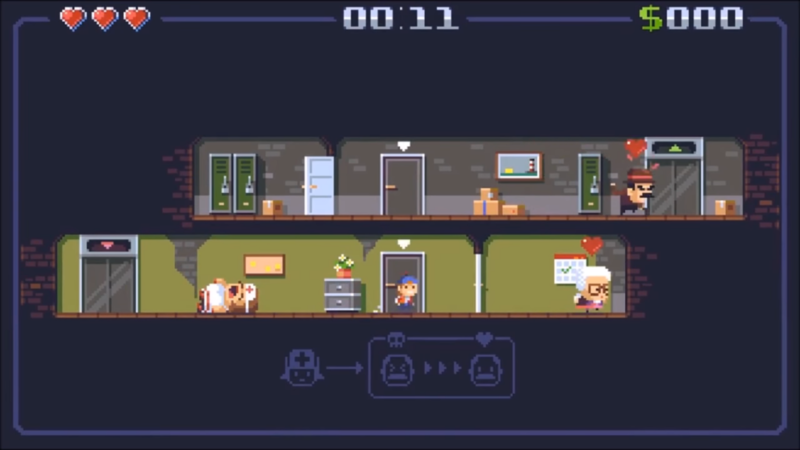 The people you encounter in the game can be several type of characters: elderly (man, woman, man in a wheelchair, woman with walking cane, etc) security guards (a fat and a thin one), nurses (a male and a female one), etc. Each character type has a unique appearance, and each type has different reactions and skills. The animations of all characters and the interactions with the environment are brilliant: each type of character has unique behavior: some fall randomly asleep, some eat snacks, etc. If you scream to startle people, stuff around you will bounce around as well. The tutorial consists of a few infographic-style images showing what you need to do, on the same screen as the stage where you are playing. These images are pretty funny and well done, they really work as an explanation. The most fun part of this game are the sounds you make yourself by screaming into your microphone! The game has a looping retro-style chiptune background track, which is very nice and catchy, but also very short and you’ll get tired of it rather quickly. 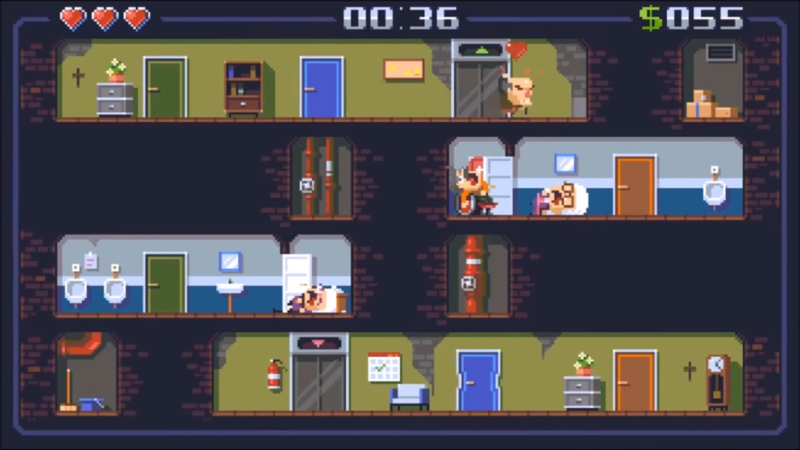 The sound effects are typical retro style sounds, for picking up money and all actions that happen, like opening doors or getting hit. The scream which your character makes to scare people also has a sound effect, but most of the time you won’t hear it over the sound you’ll be making yourself. Boo! 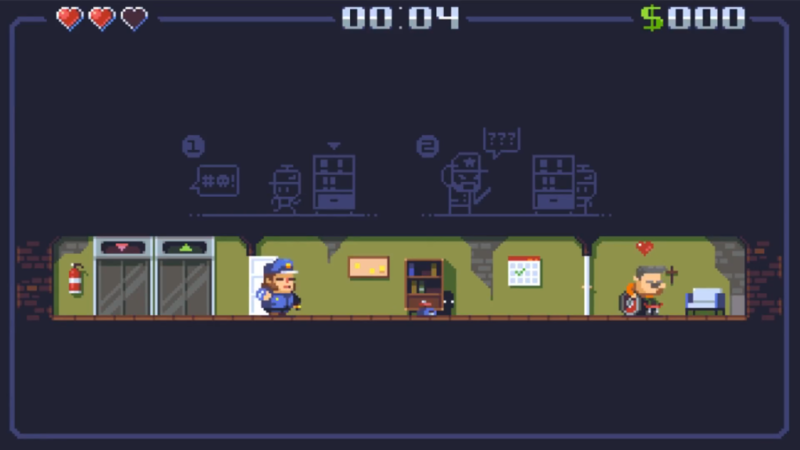 Greedy Kid is an action game, but is has a bit of a puzzle and a stealth element to it as well, since you need to figure out how to get everyone where you want, and avoid getting hit by hiding. The gameplay is where this game shines. It’s pretty awesome to be able to ‘attack’ by screaming into your microphone! Your neighbors or roommates will hate you, but it’s really brilliant to play this way. The basic premise of this game is to sneak up on people, get behind them, and scream when you are right behind their back. Some characters will die with one successful scare, but some need multiple scares to die. The ones that don’t die, will get angry, and you’ll need to run or hide, because if you get hit, you’ll lose some money and a bit of health, and you can only get hit three times before you’ll need to restart the stage. You’ll be able to pick up some of the money you lose when you get hit, but never all of it. Next to the elderly, there are also nurses, which can resuscitate the elderly who are down. The nurses can also be scared, but need more tries. It’s handy to first take as many nurses out as you can, because the more people are down, the less chance there is that you’ll get caught. There are also security guys that can’t be scared to death, and they’ll hit you and chase you and some can even taser you from a distance, so you’ll really need to watch out for them. Luckily you can either hide behind or under furniture or boxes, or quickly run to another room and circumvent the guards. At higher levels there are even soldiers and robocop-like guys you’ll have to look out for! There’ll be a timer which indicates when more difficult enemies will spawn. All characters are able to walk from one room to another room as well, so sometimes it is best to wait a bit until one room only has one or two characters, before you go in to take somebody out. Alternatively, you can taunt characters by mooning them. That really pisses them off, so they’ll chase you for a while and you can move them to another area by running away. If every character in the stage that can be scared is out cold, you can take the elevator to the next stage. You’ll be able to earn three stars for each level: one for completing it, one for getting all the money, and one for finishing it in time. So if you get hit, you’ll always lose a star because you won’t have all the money. The stages are pretty short, but there are 100 stages to work your way through in this game, so you’ll probably going to be busy with it for a while before you’ve finished them all. And there’s even a level creator in this game, so you can create even more levels, or play some which are shared by the community! But your neighbors / parents / roomies might not be too happy with you if you play this all the way through.. who is the annoying kid now? Boo! Greedy Kid is a fun game to play around with for a while. The screaming in the microphone is a really novel way to control a game, and a lot of fun to do (but probably a bit less fun for the people around you, after stage 20 or so.. luckily there is also an option to just use a button to scream, but where’s the fun in that?). There isn’t much depth to this game and it gets a bit repetitive after a while, but it’s fun to play around with, and for only a few euros/dollars it’s good value for an entertaining experience.